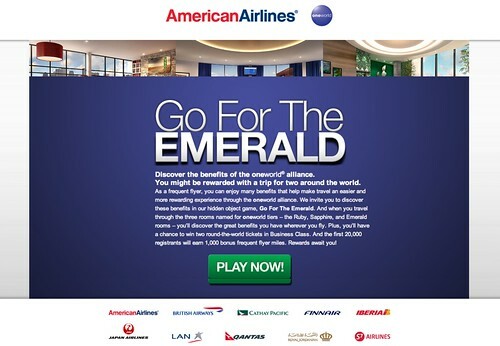 Today is the last day to enter the oneworld travel alliance “Go for the Emerald” sweepstakes. Discover the benefits of the oneworld alliance. You might be rewarded with a trip for two around the world. As a frequent flyer, you can enjoy many benefits that help make travel an easier and more rewarding experience through the oneworld alliance. We invite you to discover these benefits in our hidden object game, Go For The Emerald. And when you travel through the three rooms named for oneworld tiers the Ruby, Sapphire, and Emerald rooms youll discover the great benefits you have wherever you fly. Plus, you’ll have a chance to win two round-the-world tickets in Business Class. • There is a limit of a total of five (5) entries per email address regardless of entry method. • ENTRY DETAILS: Open to legal residents of the 50 United States and the District of Columbia who are 18 years or older. • Sweepstakes begins at 11:59 a.m. Eastern time (ET] February 22, 2012 and all entries must be received by 11:59 p.m. ET time on April 27, 2012. • PRIZE DETAILS: One Prize consisting of 2 oneworld Explorer 3- continent tickets, ARV $21,480.56. I assume that though it says 5 entries per email address that they mean per AAdvantage account. Please correct me if I’m able to enter more with other addresses! Thanks! @ MR – The rules are pretty specific, “There is a limit of a total of five (5) entries per email address regardless of entry method.” Sounds like you can use more than one address with the same AAdvantage number.